The music of Thai composer NARONG PRANGCHAROEN has been called “absolutely captivating” (Chicago Sun Times). Prangcharoen has established an international reputation and is recognized as one of Thailand’s leading composers. 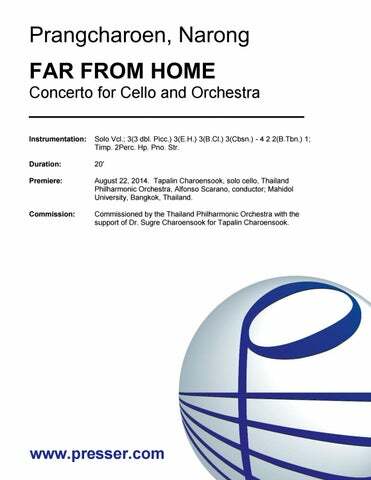 Prangcharoen has received many international prizes, including the Alexander Zemlinsky International Composition Competition Prize, the 18th ACL Yoshiro IRINO Memorial Composition Award, the Pacific Symphony’s American Composers Competition Prize, the Toru Takemitsu Composition Award, and most recently, the Annapolis Charter 300 International Composers Competition Prize. 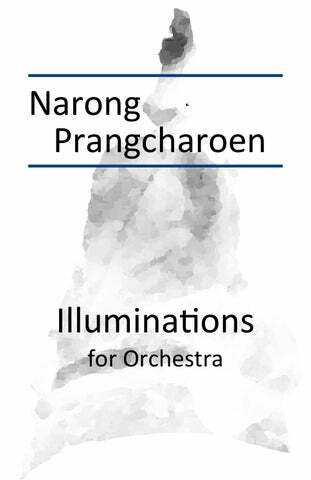 In 2007, the Thai government named Prangcharoen a Contemporary National Artist and awarded him the Silapathorn Award, one of Thailand’s most prestigious honors. 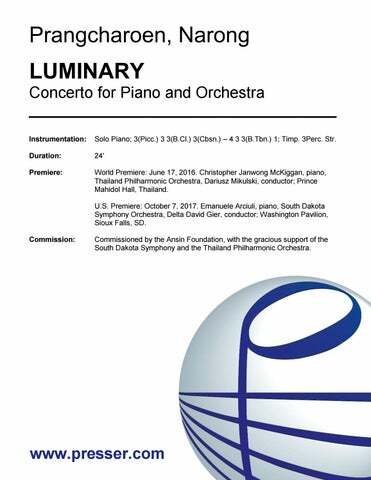 Prangcharoen’s music has been performed in Asia, America, Australia, and Europe by many renowned ensembles such as the Tokyo Philharmonic Orchestra, the Pacific Symphony, the Grant Park Orchestra, the Nagoya Philharmonic, the Melbourne Symphony, the Annapolis Symphony Orchestra, and the Bohuslav Martin? Philharmonic, under many well-known conductors, such Carl St. Clair, Carlos Kalmer, Jose-Luis Novo, and Mikhail Pletnev. His music has also been presented by, among others, The Chamber Music Society of Lincoln Center, Ensemble TIMF, The New York New Music Ensemble, the Imani Winds, and pianist Bennett Lerner. Prangcharoen’s music has been performed at many important music festivals, such as the Grant Park Music Festival (Millennium Park, Chicago), the Asia: the 21st Century Orchestra Project (Nagoya, Japan), the MoMA Music Festival (Museum of Modern Art, New York City), Maverick Concerts: “Music in the Wood” (the oldest continuous summer chamber music series in the USA), and at Carnegie Hall’s Weill Recital Hall (New York City) and the Library of Congress (Washington DC). Mr. Prangcharoen’s earliest composition studies were with Dr. Narongrit Dharmabutra in Thailand. He later studied with Drs. Stephen Taylor and David Feurzeig at Illinois State University. Prangcharoen went on to study at the University of Missouri in Kansas City, where his teachers included Drs. Chen Yi (Prangcharoen’s primary teacher), Zhou Long, James Mobberley, and Paul Rudy. Prangcharoen has taught in the Western Music Department of Srinakharinwirot University, Bangkok, Thailand, and was an Instructional Assistant Professor of Music in Composition at Illinois State University. In addition to working as a freelance composer, he is currently teaching at the Community Music and Dance Academy of the Conservatory of Music, University of Missouri in Kansas City. Prangcharoen is the founder of the Thailand Composition Festival in Bangkok, Thailand, now in its fifth year. for Orchestra 22:00 3(3 dbl. Picc.) 3 3(B.Cl.) 3(Cbsn.) – 4 3 3(B.Tbn.) 1; Timp. 3Perc. Pno. Str. 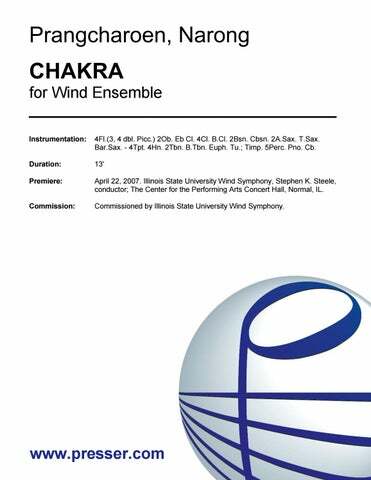 for Chamber Orchestra 10:00 1 1 1 1 – 1 0 0 0; Perc. Pno. Str. for Orchestra 5:30 2 2 2 2 – 4 2 2 1; Timp. 2Perc. Hp. Str. for Orchestra 12:00 3(3rd dbl. Picc.) 3 3(B.Cl.) 3(Cbsn.) – 4 3 3(B.Tbn.) 1; Timp. 3Perc. Str. for Orchestra 9:00 2(2 dbl. Picc.) 2 2 2 – 4 2 2(B.Tbn.) 1; Timp. 2Perc. Hp. Pno (4-hands) Str. for Orchestra 15:00 3(3 dbl. Picc.) 3 3(3 dbl. B.Cl.) 4(Cbsn.) – 4 3 3(B.Tbn.) 1; Timp. 3Perc. Pno. Str. for Orchestra 8:00 3(3rd dbl. Picc.) 3 3(B.Cl.) 3(Cbsn.) – 4 3 3(B.Tbn.) 1; Timp. 3Perc. Pno. Str. The Mysterious and Unexplained 9:00 3(3rd dbl. Picc.) 3 3(B.Cl.) 3(Cbsn.) – 4 3 3(B.Tbn.) 1; Timp. 3Perc. Pno. Str. for Orchestra 8:15 3(3rd dbl. Picc.) 3(3rd dbl. E.H.) 3(3rd dbl. B.Cl.) 3(Cbsn.) – 4 3 3(B.Tbn.) 1; Timp. 3Perc. Str. for Orchestra 7:00 2(2nd dbl. Picc.) 2 2 2 – 4 2 2 1; Timp. 2Perc. Str. 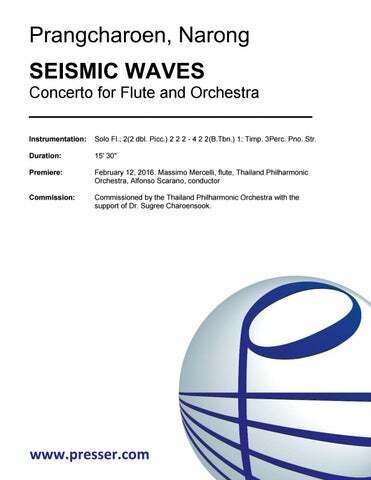 Concerto for Flute, Oboe, Clarinet, Bassoon and Orchestra 17:00 Fl. Ob. Cl. Bsn. Soli: 2(2 dbl. Picc.) 2 1 2(Cbsn.) – 4 2 2(B.Tbn.) 1; Timp. 3Perc. Str. 20:00 3(3 dbl. Picc.) 3(E.H.) 3(B.Cl.) 3(Cbsn.) – 4 2 2(B.Tbn.) 1; Timp. 3Perc. Hp. Pno. Str. for Tenor Saxophone and Orchestra 15:00 Solo Sax. ; 3(Picc.) 3(E.H.) 3(B.Cl.) 3(Cbsn.) – 4 3 3(B.Tbn.) 1; Timp. 3Perc. Pno. Str. Concerto for Cello and Orchestra 20:00 Solo Vcl. ; 3(3 dbl. Picc.) 3(E.H.) 3(B.Cl.) 3(Cbsn.) – 4 2 2(B.Tbn.) 1; Timp. 2Perc. Hp. Pno. Str. Concerto for Guitar and Orchestra 22:00 Solo Guit. ; 3(3 dbl. Picc.) 3(E.H.) 3(B.Cl.) 3(Cbsn.) – 4 2 2(B.Tbn.) 1; Timp. 2Perc. Pno. Str. for Bass Clarinet and Orchestra 23:00 Solo B.Cl. ; 3(3rd dbl. Picc.) 3 3(B.Cl.) 3(Cbsn.) – 4 3 3(B.Tbn.) 1; Timp. 3Perc. Pno. Str. Concerto for Piano and Orchestra 24:00 Solo Pno. ; 3(Picc.) 3 3(B.Cl.) 3(Cbsn.) – 4 3 3(B.Tbn.) 1; Timp. 3Perc. Str. Concerto for Saxophone (alto and soprano) and Orchestra 17:00 Solo A.Sax./S.Sax. ; 3(3 dbl. Picc.) 3 3(3 dbl. B.Cl.) 3(Cbsn.) – 4 3 3(B.Tbn.) 1; Timp. 3Perc. Pno. Str. for Suona and Orchestra 15:00 Solo Suona; 2 2 2(2 dbl. B.Cl.) 1(Cbsn.) – 4 2 3(B.Tbn.) 1; Timp. 3Perc. Pno. Str. Concerto for Flute and Orchestra 15:30 Solo Fl. ; 2(2 dbl. Picc.) 2 2 2 – 4 2 2(B.Tbn.) 1; Timp. 3Perc. Pno. Str. for Cello And Wind Ensemble 18:00 Solo Vcl. ; 3(3 dbl. Picc.) 2 5(E-flat Cl., B.Cl.) 2, A.Sx. T.Sx. Bar.Sx. – 4 2 2(B.Tbn.) 2(Euph. ); Timp. 3Perc. Pno. Cb. for Wind Ensemble 13:00 4Fl. (3, 4 dbl. Picc. ), 2Ob., Eb Cl., 4Cl., B.Cl., 2Bsn., Cbsn., 2A.Sax., T.Sax., Bar.Sax. – 4Tpt., 4Hn., 2Tbn., B.Tbn., Euph., Tu. ; Timp. 5Perc. Pno. Cb. for Wind Ensemble 14:00 Picc., 3Fl., 3Ob., EbCl., 4Cl., B.Cl., 2Bsn., Cbsn., Sop.Sax., A.Sax., T.Sax., Bar.Sax. – 3Tpt., 4Hn., 2Tbn., Euph., Tu., Cb., Pno. ; Timp. 4Perc. 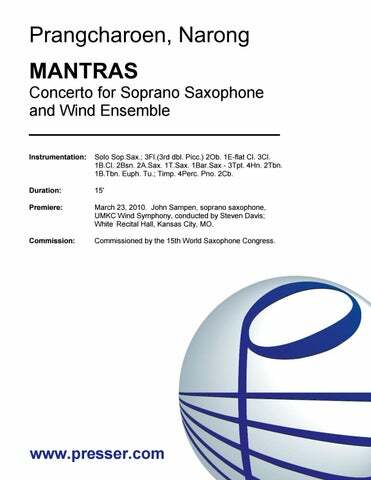 Concerto for Soprano Saxophone and Wind Ensemble 15:00 Solo Sop.Sax. ; 3Fl. (3rd dbl. Picc.) 2Ob., 1E-flat Cl., 3Cl., 1B.Cl., 2Bsn., 2A.Sax., 1T.Sax., 1Bar.Sax. – 3Tpt., 4Hn., 2Tbn., 1B.Tbn., Euph., Tu. ; Timp. 4Perc., Pno. 2Cb. for Wind Ensemble 8:00 Picc., 3Fl., 3Ob., EbCl., 3Cl., B.Cl., 2Bsn., Cbsn., 2A.Sax., T.Sax., Bar.Sax. – 3Tpt., 4Hn., 2Tbn., B.Tbn. Euph., Tu. ; Timp. 3Perc., Pno. Cb.